A sensational way of enjoy Koh Chang's lush jungle and forests. Tree Tops Adventure Park in the South of Koh Chang contains an assortment of games such as rope bridges, tarzan swings, flying skateboards, and giant zip lines. From one platform to the next, from tree to tree, Balancing yourself as you go. 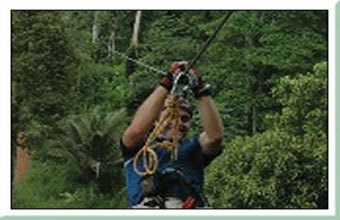 Tree Tops adventure course is divided into an easy course and challenging course. Altogether, there are over 30 obstacles in a beautiful hill-side area by the sea. No matter how old you are, our course is designed so that everyone can participate. In over 2 hours of fun and excitement. We guarantee an unforgettable experience and work out! Activities at Tree Top can be done in drizzling rain, however, in case of rain storm, cancellations can be made on the scheduled date and no charge will be incurred. Our mandatory briefing will teach you how to use the slings, carabineers, pulleys, and harnesses safely. Participants will be divided into groups of no more than 15 and qualified operator will accompany each group through the entire course. All of our equipment is built to European Standards and safety is guaranteed.